Home » »Unlabelled » What Kind Of Person Are You Based On Your Finger Shape? What Kind Of Person Are You Based On Your Finger Shape? We will analyze yourself based on your finger shape. Don't laugh, this is actually pretty accurate! Please share it with your friends if you like it! 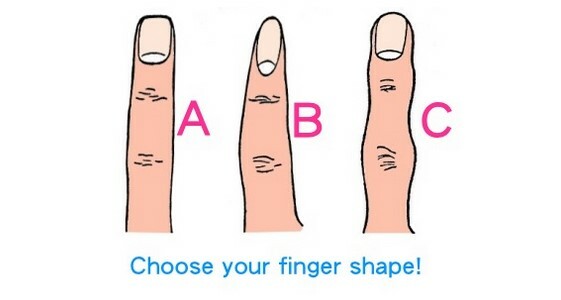 Which shape is most like your finger? -You tend to hide your feelings and like to be melancholic. You often pretend to be stronger and more independent than you actually are. - You are quite an emotional type. You will be super nice to anybody once you get to know them. - You are a fair person and you hate lies, hypocrisy, and deception. - Like to pretend to be strong and cool. Not showing much emotion. - A little eccentric and arrogant. Couldn't stand seeing a lot of things. - You love to laugh a lot, and will laugh at anything even if it's not very funny. All of your thoughts can be seen through your expressions. - You are cold towards people you're not really close to, but are overly emotional towards your loved ones. - You are very loyal. Once you fall in love with someone, you will give them your full attention and will always think about them. - You are actually very sensitive, but you don't quite look like you are, because oftentimes you are protecting someone's feelings by pretending that you don't know anything. - Once you decide to do something, you'll strive to do it until the end. - You're afraid of being hurt. You pretend that you're okay when you're alone, but actually, you're not. - You appear to be a strong and independent person who always speaks rather harshly although you are very soft-hearted and easily hurt inside. - You like to imagine things. You always dream of someone who will understand and love you, and give you everything you want. - You are easily touched. - You easily let go of things that make you angry, and you don't hold grudges. - You don't like challenges. You don't like to deal with anything unfamiliar to you. - You could sometimes be overbearing. Your ego is extremely high when quarreling with someone, but after that, you will apologize first to the person you were quarreling with. - You always keep your feelings and problems only for yourself. - You don't like to pretend, and you know well what you like and dislike. You also like people to trust and depend on you. - You have a soft heart, and can easily be hurt, so whenever someone apologize to you, you will always forgive them because you can't stand being in fight with somebody for too long.